Ok, so we’re already looking at an September move in date. Man, I thought I could do this faster than a typical client project timeline since I’d be running the show. I was wrong. BUT if we can get moved in, in under a year I think we’ll still beat the standard client timeline, for a project of this size. The main floor of our home was an easy plan to make. We are removing a wall between the kitchen and back bedroom to make it a small family room. We love spending time in the kitchen and this will really be the heart of our home. I picture myself in the kitchen making yummy stews and Toby playing with his friends in the family room. I can’t wait! Below I've included plans and a detailed rendering of our kitchen design! The dining room has a TON of old charm that we’re keeping. In the center of it is this wonderful old hutch that I can’t wait to fill with my grandmothers vases and other family items. The dining room has gum wood paneling that we love for the warmth it brings into the living room. I am hoping I can sand it down and oil it to a lighter tone of wood. But either way we’re not painting it. The living room will be used as another family room minus the TV. This room gets AMAZING natural light and I picture Sunday mornings in here with coffee and legos. I can’t wait - have I already said that?! We also have this super charming front foyer on our main floor of living. Remember we’re living on the second and third floor. 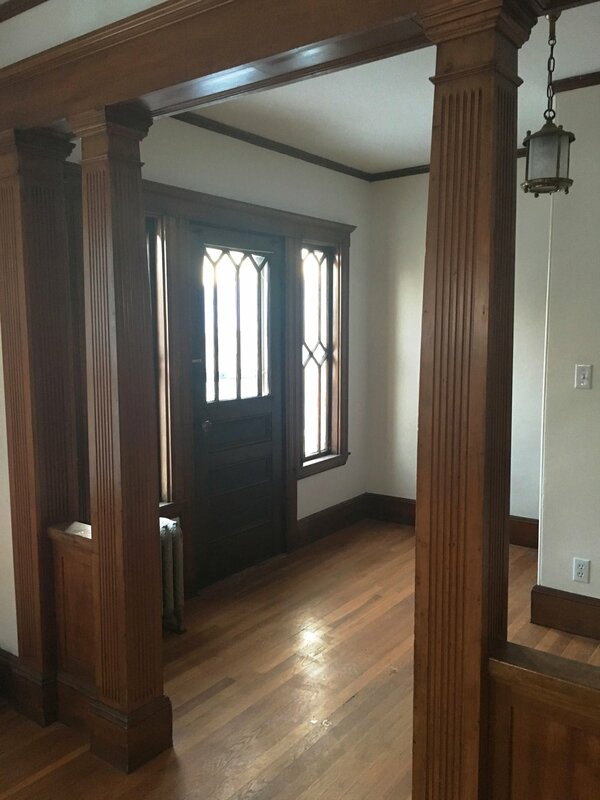 So we don’t get a typical foyer at the front door but we have one off the living room with stunning old doors that lead out to our front porch. The doors need a ton of work but my father is going to bring them back to life for us. I’ve already bought a cute little console and have a light on hold at SYD+SAM for this space! We want to have a landline so Toby can pick up the phone and talk to his grandparents and friends. This was something I loved as a child and want to keep in Toby’s life even though landlines are quickly disappearing. Aside from inspections and all the unexpected things the groundwork of a new project can bring, getting to design my own home has been so fun! Thanks for keeping up with my project updates and check out our Instagram stories for more!